Mazda 3 Interior, Sat Nav, Dashboard | What Car? Drivers of all shapes and sizes should have no problem getting comfortable behind the wheel of the 3. There's a good range of adjustment in the seat, and the steering wheel moves in and out as well as up and down. Adjustable lumbar support is standard on the driver's seat too, even on the cheapest trims, and the centrally mounted armrest can be used by both front occupants. All of the major controls are within easy reach and the dashboard is fairly logically, so you won't be flummoxed every time to try to tweak the air-conditioning. There’s a clear enough view through the windscreen of the 3; the top of the dashboard isn't particularly high and the front A pillars aren’t too thick. The view out of the back is a different story, though; the rear screen is fairly narrow, so you may find it difficult to judge the rear extremities when you're reversing. There’s also virtually no visibility over your shoulder because of the huge C-pillars. 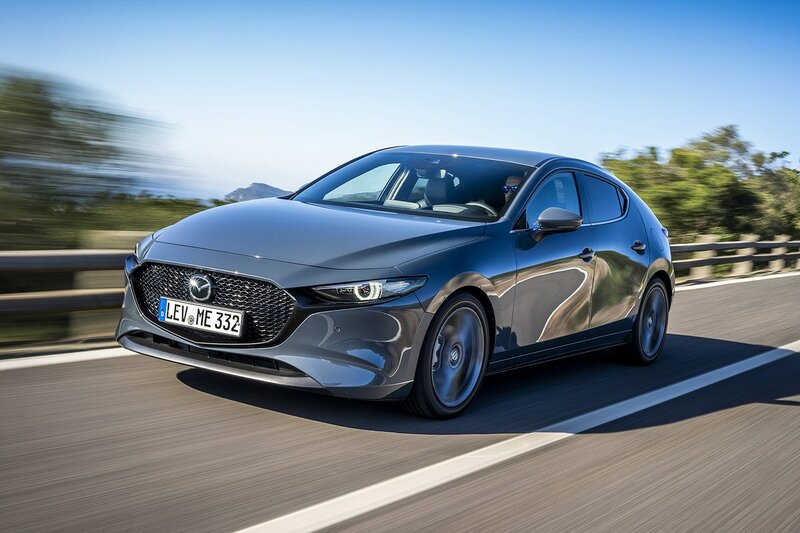 Thankfully, all bar the entry-level model have front and rear parking sensors plus a high definition reversing camera to help mitigate this, with range-topping GT Sport Tech models adding a 360-degree camera. All trim levels have a pin-sharp, centrally mounted 8.8in infotainment display. The system is easy to use, quick to respond and surprisingly easy to master, thanks to an intuitive rotary controller mounted between the front seats. 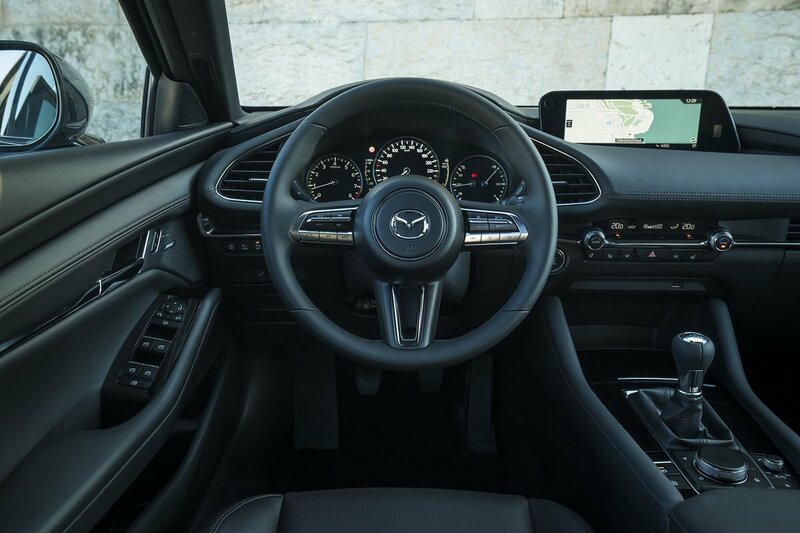 We welcome Mazda’s decision not to use a touchscreen; the brand has expressed concern that they can be distracting to use while driving. The infotainment system is impressively equipped, too; even the entry level model has with DAB radio, Bluetooth, Apple CarPlay, Android Auto, sat-nav and a head up display. That latter tech is frequently an option on cars costing three times as much. With a slender dashboard and a small steering wheel, the interior of the 3 has a graceful, uncluttered minimalism to it, as if the designers have been taking tips from Marie Kondo. 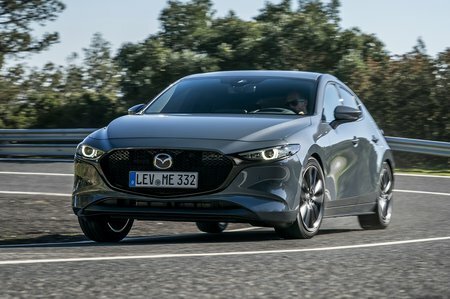 Indeed, it looks as though every unnecessary ancillary control has been removed, leaving the driver with only the essentials – a refreshing approach that has allowed Mazda to focus on making sure all that's left operates with a really slick, high-quality feel. There are dense, soft-touch surfaces to most of the dashboard, too, with attractive finishes and well-judged flourishes of chrome trim.